Can we ask you a serious question? When’s the last time you turned up your favorite fuzz pedal to anything but eleven? If there’s one true thing about rock n’ roll, it’s that it sounds best cranked all the way up. But where do we go from here? We go one louder. 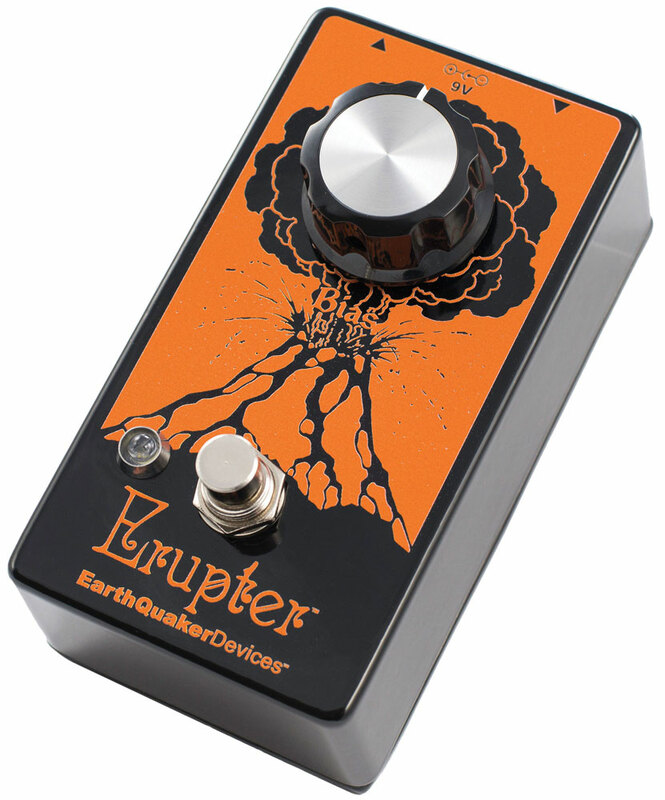 Enter the Erupter. 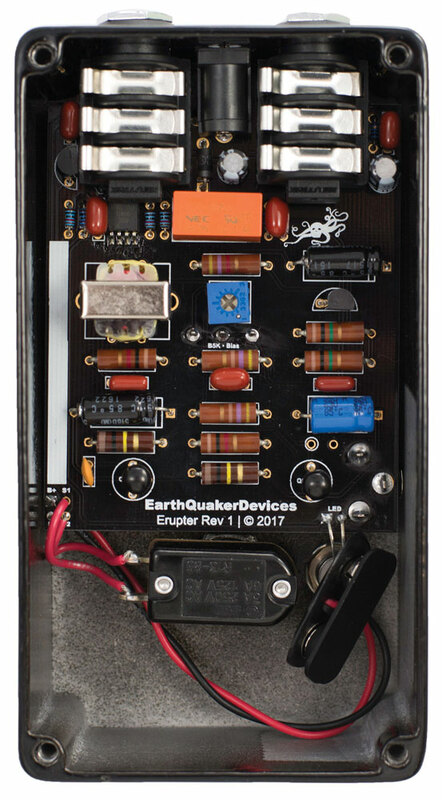 The Erupter is the result of over two years’ worth of tone-chasing, tweaking, and experimentation in search of the ultimate classic fuzz tone with a big low end, a biting top end without being too harsh, and just enough output to politely send a tube amp over the top to deliver a well-rounded and defined fuzz tone with just enough pummeling intensity, so you can rock n’ roll all night and still get to bed at a reasonable hour. It’s the perfect fuzz... just sayin’. 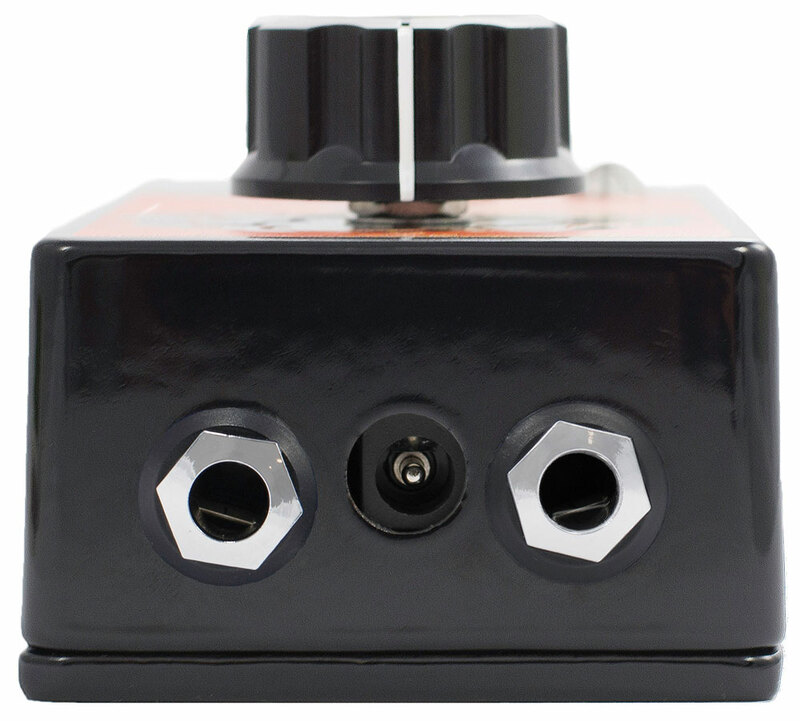 Bias: This control has a center detent for the “perfect” fuzz setting. When in the center position, the tone will be big and round with a slight volume boost and great sustain. As you turn this counterclockwise it becomes more gated with lower output. As you turn this clockwise it becomes louder and more refined. 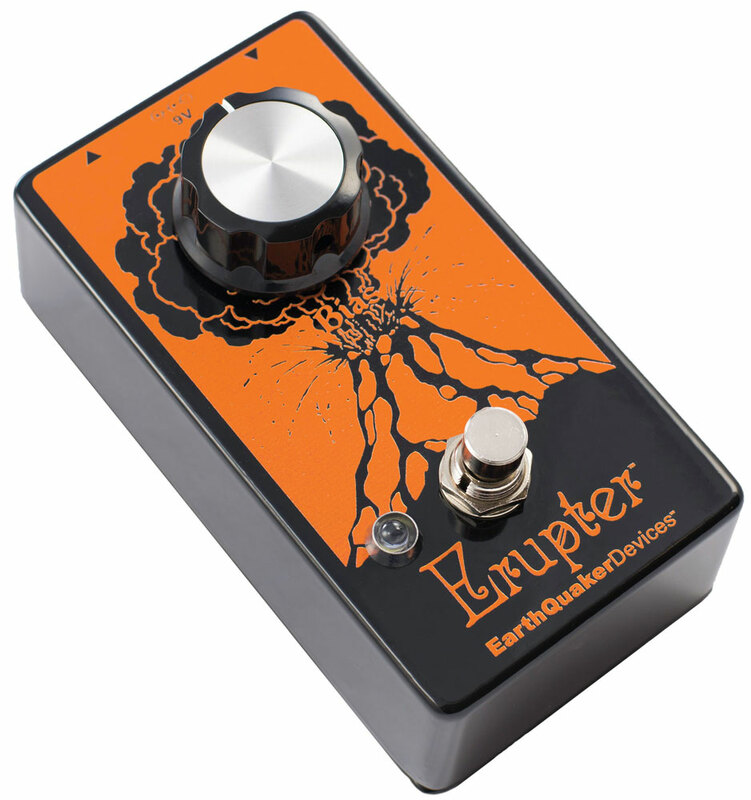 The Erupter™ fuzz started as something I wanted just for myself - the ultimate classic fuzz tone. One with a simple, yet effective control interface and that works anywhere in the signal chain. A fuzz with a big low end, but not too mushy, a biting top end without being too harsh, and just enough output to politely send a tube amp over the top. It must also have excellent wide-range clean up with the guitar’s volume control without losing too much low end. It took a long time and a lot of experimenting to get there but I think I finally nailed it. A lot of people think this classic circuit is a no-brainer due to its low parts count, but I beg to differ. Since there are so few parts in the circuit, everything makes a difference. That’s why you see so many variations on the market today. You can use the topology, but the sound always varies. I’ve made plenty of designs based on this circuit in the past, but none of them gave me the perfect, overloaded-yet-refined full-force fuzz tone with crushing lows, smooth top end and an input that is responsive through the full range of the guitars volume control without losing too much low end in the process. Until now! I spent almost two years swapping transistors, measuring resistors, adding controls, removing controls, trying all types and values of capacitors, and basically using every trick I ever learned. What I landed on is exactly the sound I had in my head - the perfect crushing fuzz tone. I managed to whittle down the controls to the most important one of all, Bias. Why leave out the volume and fuzz controls? Most people leave the volume and fuzz all the way up, at least that’s the way I always do it. This yields the thickest fuzz and the level is slightly above unity to push the full frequency range of the guitar out front when you kick it on. By setting these at maximum and allowing control over the bias, you can freely adjust the character of the fuzz for more tonal variations. We had a custom center-detent pot made to fit the required resistance for the Erupter. When the Bias control is set at noon you will feel a little click. That means the pedal is perfectly biased to give the best possible fuzz tone. As you turn the Bias counterclockwise (colder) the fuzz lowers in level and becomes more gated. As you turn the Bias clockwise (hotter), the fuzz becomes cleaner and more refined and the output level increases. 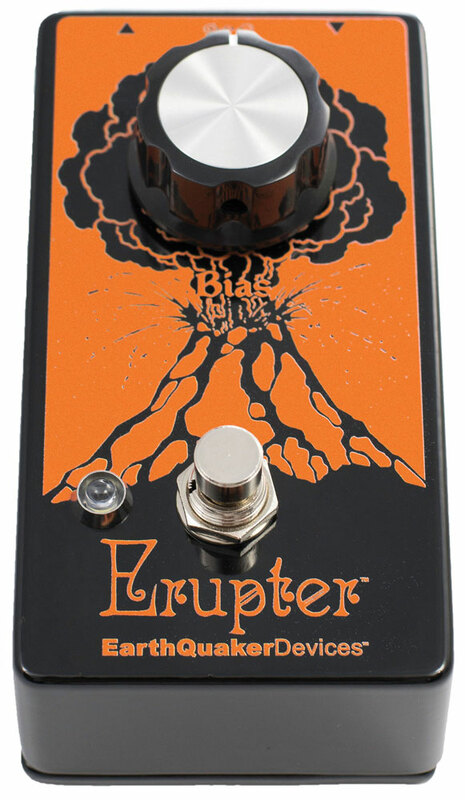 The Erupter also has a buffered front end to give the best possible input signal with stronger highs, tighter lows, and allows it to be used before or after any other effects (even a wah pedal) without the usual problems associated with this circuit. What!? How’s it do that? By using transformer based pickup simulation, of course. It’s a cool little trick I learned from an article written by Jack Orman almost 15 years ago. These two features allow greater use of the guitar’s volume control to clean up the fuzz. Try it, you’ll be amazed at the amount of tones you can get all the way across the dial! But what about the parts? What kind of magic is in there? 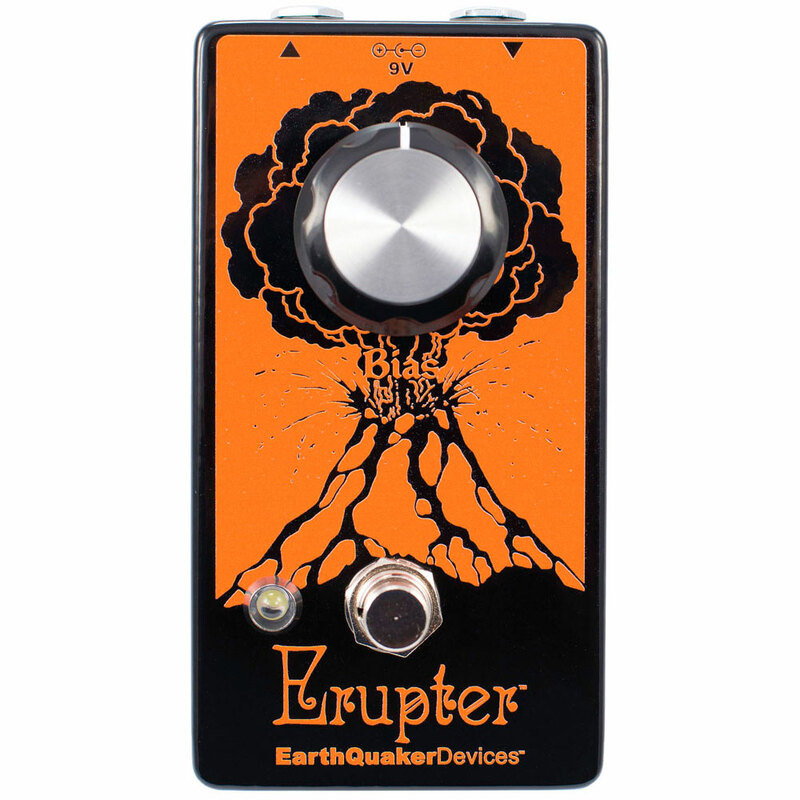 The Erupter uses new production 5% ½ watt carbon composition resistors, metallized polyester film capacitors, Sprague and BC electrolytic capacitors and NOS, hand-matched, low gain silicon transistors for temperature stability and predictable operation under all extremes. I tried a lot of parts in this circuit during the development. Everything from our usual production 1% metal film resistors and caps to expensive NOS paper in oil capacitors. I tried every rare germanium transistor I had and countless different silicon transistors. What I landed on gave me the well-rounded and defined fuzz tone with just enough pummeling intensity that I’ve been wishing for. This device is true bypass and uses electronic relay-based switching. Audio will not pass without power. This device can be powered by a 9v battery or a standard 9-volt DC power supply with a 2.1mm negative center barrel. We always recommend pedal-specific, transformer-isolated wall-wart power supplies or multiple isolated-output supplies. Pedals will make extra noise if there is ripple or unclean power. Switching-type power supplies, daisy chains and non-pedal specific power supplies do not filter dirty power as well and let through unwanted noise. DO NOT RUN AT HIGHER VOLTAGES!